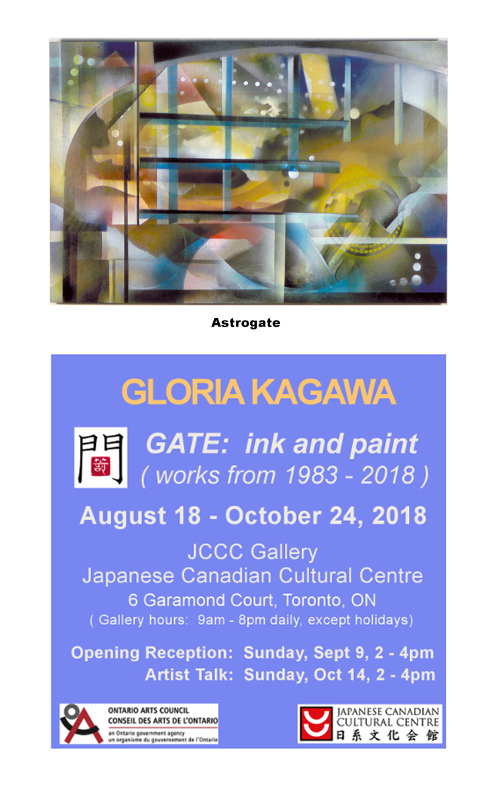 I would like to let you know about an inspiring art show by my good friend Gloria Kagawa that is taking place at the Japanese Canadian Cultural Centre Gallery in Toronto, Ontario, Canada (JCCC). Gloria’s show, called ‘Gloria Kagawa – GATE: ink and paint (works from 1983 – 2018)’ , is a retrospective of her life’s work and accomplishments as an artist. I’m planning on being there to take in Gloria’s beautiful and intriguing artwork at the opening reception on Sunday, September 9th, 2018 from 2 to 4 pm. If you don’t have the opportunity to see Gloria’s work in person, be sure to check back here for highlights of the opening, as I plan on photographing the event. Be sure to check out Gloria’s website at gloriakagawa.com , and you can find more detailed information from the Japanese Canadian Cultural Centre website . Hope to see you there!